Glynnis O'Connor is best known for her work in the mid-1970s TV presentation of Our Town. She starred in a 1977 television production of "Our Town" as Emily Webb, and in 1984's "Why Me?" as Leola, an injured Air Force nurse whose disfigured face is gradually reconstructed. She also co-starred in "Jeremy" and "Ode to Billy Joe" with Robby Benson, "The Boy in the Plastic Bubble" with John Travolta, and in "Johnny Dangerously" as Johnny's sister-in-law Sally. Good works, all. Glynnis O'Connor (born November 19, 1956) is an American actress of television, film, radio, and theater. 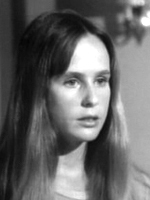 She first gained wide attention in the mid-1970s with leading roles in the television version of Our Town and in the short-lived series Sons and Daughters. She also co-starred with Robby Benson in the films Jeremy in 1973 and Ode to Billy Joe in 1976, as well as with Jan-Michael Vincent in the film Baby Blue Marine in 1976. In 1984, O'Connor co-starred with Armand Assante in the made-for-TV movie Why Me?, a drama about a United States Air Force nurse named Leola Mae Harmon, who must undergo a series of facial reconstruction surgeries after a horrifying car accident. She was cast too in 1984 in the comedy Johnny Dangerously, along with Michael Keaton, Peter Boyle, and Joe Piscopo. In 1986, O'Connor performed in the NBC made-for-TV movie The Deliberate Stranger with Mark Harmon. From the late 1990s through 2004, she had a recurring role as Anne Paulsen on Law & Order. In 2007 she co-starred with John Heard, Vincent Pastore, and Robert Picardo in the independent feature film P.J., directed by Russ Emanuel. She appeared too in the film Our Last Days as Children.